GPS, brown paper bags, water bottles? Check, check, and check. We were ready. I’d been mentally preparing for this trip, fantasizing about it really, for years. “Here, here, stop here,” I demanded. Greg slowed the car to a stop a few feet from the dense woods. I didn’t bother with an answer. I was out of the car before he cut off the engine. This was that seldom captured moment where one sits perched on the verge of making a dream come true. I closed my eyes and inhaled the perfume of a crisp spring morning, a scent so different from the city. At long last, we were steps away from becoming foragers. Bags and bags of morels? I’m certain my jaw hit the table, and it’s likely I even spilled my wine as she recounted her tale with such intoxicating detail. Now I’ve known the pleasure of collecting my own bag of morels. It was a single bag, weighing well under a pound, and it cost me about $25 at the Farmer’s market. “Really? Bags and bags of morels?” I asked unable to hide my disbelief. “Oh, it was at least ten pounds, maybe more,” she assured me. And with those words the die was cast. “Next year, we’re going to find our own morels,” I vowed. But when next year arrived, our busy schedules took precedence, and we repeated the sins of the years prior plunking down even more money for a single bag of morels, a bag that I shamefully noted would fit in my coat pocket. Schedules not withstanding, there remained the matter of knowing where to look and more importantly what to look for. Foragers and mushroom hunters never reveal their sources. I had hoped to befriend a mushroom hunter, a mentor of sorts, that old man selling mushrooms out of his paneled station wagon. Perhaps he was in need of an apprentice? Or just an earnest cook who loved mushrooms? Maybe he longed for someone to share his craft with as much as I longed to learn the craft. As it turns out, even an eighty-plus-year-old man peddling wild mushrooms from a car half his own age has no interest in passing on his knowledge. Already convinced this would be our year, a caller on a recent episode of The Splendid Table sealed the deal. This chap had a real dilemma on his hands–what to do with his extra morels. Each year he harvests between ten and fifty pounds. Fifty pounds! Oh heavens, and the poor dear was getting a bit bored with his morels. What to do? I’m ashamed to admit this, but I might have hung up on him. Alas, Lynne Rossetto Kasper, the ever patient and gracious host of the radio show, went on to offer him dozens of new ideas for how to prepare his bags and bags of morels. Humph. So with all of this in mind, a backpack full of everything we thought we needed (One morel website suggested taking beer on the hunt. As it turns out, it was a sound bit of advice that I didn’t follow and regretted three hours into the hunt. ), and boundless naive determination, we headed into the woods. “Where exactly?” you might ask. In the spirit of becoming a true forager, that information is classified. Four hours later our hunt was over, the brown bags I’d foolishly packed with such optimism, empty. A firm believer that life is about the journey and not the destination, I’ll admit it was the most meditative, relaxing afternoon I’ve had in a very long time. A mild spring day spent hiking in dappled sunlight with the one I love–how could I feel disappointed? Besides, our foraging wasn’t for not. We spotted chives, which grow with abandon in my herb garden. We found a single stinging nettle plant that we left behind not wanting to take the only specimen. And we successfully identified two varieties of “false” ramps (a.k.a wild onions), the lily of the valley and the trout lily. I dare say Euell Gibbons would have been proud. “Maybe we’ll have better luck after a rain,” I said as I unpacked our gear, already determined to try again. “Uh, huh,” Greg said in that familiar “I’m not listening” kind of way. He was standing with his back to me toiling with a pile of something on the kitchen counter and pulling things from his pockets. Apparently I was the only one that left the woods empty handed. My forager husband came home with acorns, walnuts, three antique bottles and a glass candle holder. The smile on his face gave me the answer I was looking for–our first foraging adventure would not be our last. This is a recipe mash-up, if ever there was one. It all started with Yotam Ottolenghi’s garlic tart recipe in Plenty. Sweet caramelized garlic suspended in a sea of creamy goodness punctuated with tangy cheese. I add roasted red peppers to mine. The gentle smoky flavor adds depth and amps up the sweetness just a notch. Now, on to the crust. Annie Somerville‘s yeasted tart dough in Fields of Greens is pure genius. The dough sacrifices the fat of the butter-laden pastry crust without skimping on flavor. And the almost biscuit-like texture is a nice change of pace. For an added bonus, there’s no blind baking with the yeast dough–just press it in the pan, fill it, and bake it. That said, you can make this with any tart crust you like. The original recipe called for puff pastry. For the dough*, whisk together the flour, yeast, and salt in a large bowl. Make a well in the center. Add the egg, butter, and water. Mix to form a soft, slightly tacky dough. Bring the dough together with floured hands if it gets too stiff to stir. If it’s too sticky, add flour a little at a time. Transfer the dough to a greased bowl. Cover with plastic wrap and let rise in a warm, draft-free place until doubled, about 45 minutes to an hour. While the dough is rising, put the garlic cloves in a small sauce pan and cover them with water. Bring to a boil. Reduce heat and simmer for 3 minutes. Drain the cloves and dry the pan. Return the cloves to it and add the olive oil. Fry the cloves over moderate heat until blistered, about 3 minutes. Add the vinegar and water. Bring to a boil, then reduce heat and simmer gently for five minutes. Add the honey, thyme leaves, and a pinch of salt. Continue simmering over moderate heat until most of the liquid has evaporated and the cloves are coated in a thick syrup, about 6-8 minutes. Using lightly floured hands press the dough evenly along the bottom and up the sides of the tart pan, about 1/4″ higher than the rim. If the dough shrinks back, cover it with plastic wrap and let it relax for 15 minutes. Fill it at once or refrigerate it until you’re ready. In a small bowl, whisk together the eggs, heavy cream, and crème fraîche. Season with salt and pepper. To assemble the tart, crumble the feta cheese and scatter it over the bottom of the tart. Follow it with the 1/2 cup of grated Parmesan. Spoon the caramelized garlic cloves and any remaining syrup over the cheeses. 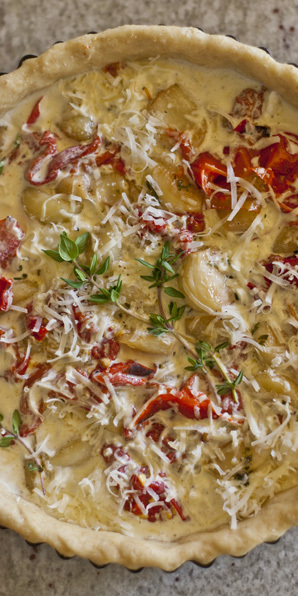 Sprinkle the roasted red pepper slices on top. Pour the custard over the tart filling. You want to see the garlic and peppers peeking out. Dust the top with the remaining grated cheese. Lay the reserved thyme sprigs on top. Bake for 40-50 minutes, until the custard is set and the top is golden brown. *tip: The dough freezes well. Wrap it in plastic wrap then foil without letting it rise. Remove it from the freezer several hours before you want to use it. Let it thaw at room temperature loosely covered in plastic. It’s ready to use when the ball has doubled in size. Ready for another savory tart? 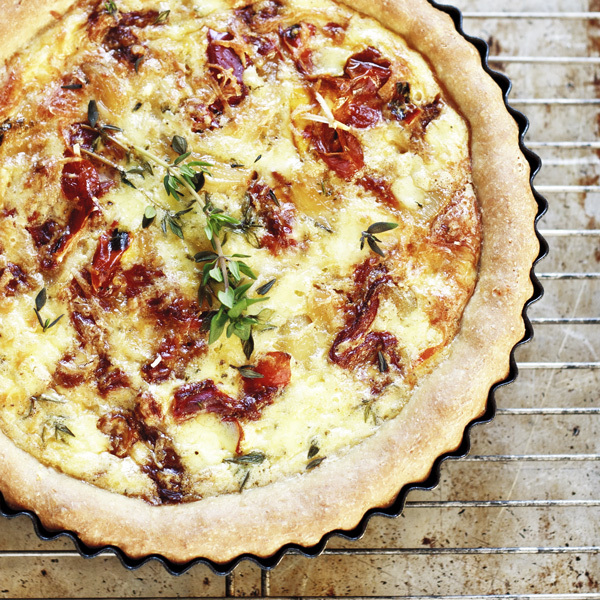 Try this Apple Cheddar Quiche with Ham and Sage. Loved this story. You had me on the edge of my seat. But I must admit, I knew it wasn’t going to end with bags and bags full of wild morels! I am so happy you didn’t use puff pastry as the crust. For some reason it always feels like cheating when you use puff pastry. Can’t wait to try this. Absolutely wonderful and what incredible photos. 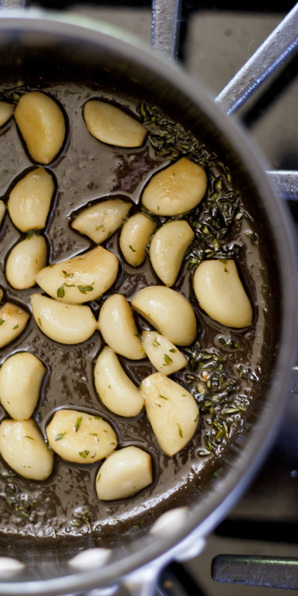 Garlic, when thoroughly cooked in this way has a simply incredible taste – really sweet and nutty. One of my favourite ways to eat it. An amazing quiche (tart). People tell us every year, “I’m sure you have ramps and morels on your land.” Well, I can definitely say after decades of looking, we don’t! Still, as you say, the chase—even if unsuccessful—can be rewarding. Beautiful photos. I’ve often drooled over that recipe in Plenty and your adaptation looks great.